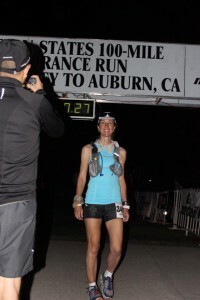 Every ultra runner’s dream: the Western States starting line. 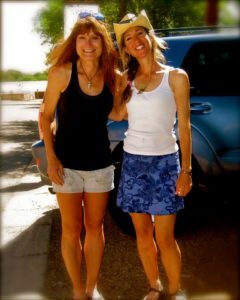 Last December, my friend Rachael and I entered and won the Western States lottery. After the first wave of excitement had passed, we did our homework. We read piles of race reports. We watched Unbreakable over and over. 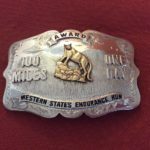 All this research told us exactly what the Western States website says: it’s a downhill race, and it can be a very hot one. 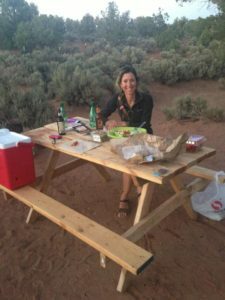 In early June, we decided to meet in Moab, Utah, for one last weekend of heat training before it was time to taper. On Friday evening, we set up our tent, then decided to carbo-load for the next day with a couple of beers. Alcohol helps people come up with ideas that seem smart at the time. We looked at the weather forecast, which promised 104 degrees. Rachael grunted. We slogged along a rocky doubletrack, dodging cactus spines. Red dust covered us from head to toe. Our sweat evaporated as soon as it seeped out of our pores. Salt formed a crust on our bodies, where it mixed with the layer of dirt. A large black bird flapped its wings above our heads. “Is that a vulture?” Rachael asked. I wasn’t sure. Birds of prey are not my area of expertise. I tripped over a rock and fell. I got back up. We slowed to a walk. The water in our packs was hot enough to make tea, which we hadn’t brought and didn’t want. We fantasized about large buckets of ice. The vulture had left. He was probably calling his friends, inviting them to a feast in a few hours. Or maybe he was taking his pre-dinner siesta. We kept moving. My Garmin said we had gone nine miles. It seemed a lot further. We decided to turn around. The valley floor felt like a furnace. Our ground speed slowed to a crawl. Our conversation slowed to an exchange of “grmmph” sounds. The canyon wall did not come any closer. The vultures were probably getting their napkins and silverware ready. An engine sounded in the distance. We stopped and turned our heads. The salt that seeped into our eyes, and the dust on our sunglasses, made it difficult to see. But we both heard it. This meant we were not hallucinating. 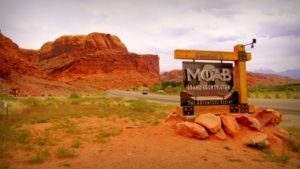 We recalled that Moab is an off-road driving destination. A red jeep made its way toward us. It slowed down, then stopped. The window on the driver’s side rolled down. A round, pink face appeared in a cloud of frigid air. We moved closer, eager to benefit from the unexpected whiff of air conditioning. “Of course not!” I added. What made this ignorant person think we needed a ride? Just because we were two women stumbling around in the middle of nowhere? In the desert, in the mid-day heat? Just because we wore running skirts and hydration packs and not much else? I realized that we looked like a pair of hookers past their prime, preying on innocent tourists. The smile under the grey crew cut changed to a bewildered, even concerned expression. Another pleasant, round face, this one female, with a head full of tight iron-grey curls, leaned over from the passenger side to see what was going on. Clearly, both of them thought we were incoherent. Maybe they thought we were insane. Rachael and I looked at each other. Both doors opened. The pleasant elderly couple, plump and rosy in their spotless polyester shirts, bermuda shorts and sensible sandals seemed happy to help. A large cooler sat in the back of the jeep. We felt ecstatic, but didn’t want to scare them away. 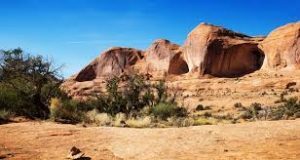 “Nice day to be out in the desert, isn’t it?” Rachael said in a chatty tone. Her braids, caked with dirt, stuck out from the side of her head at a ninety-degree angle. The tourists nodded, happy to revert to conventional discourse patterns. “Where are you guys from?” I inquired, encouraged. I could feel blood running down my shin, from the fall I had forgotten about until then. Some sand was stuck between my teeth. I spit it out, making an effort to be discreet. “Las Vegas, New Mexico” I said, prepared to launch into the usual explanation of how this was a very different place from Las Vegas, Nevada. But now Mr. Tulsa was opening the cooler, which looked to us like a treasure chest in a pirate’s cove. It was filled to the brim with ice. Much better than gold coins. Our eyes lit up. We abandoned further attempts at small talk and grabbed handfuls, stuffing it under our hats, into our sport bras, down our skirts. We discovered cans of soda underneath the ice and guzzled a couple of them, refined sugar and all. I considered taking an ice bath in the cooler, but didn’t want to appear greedy, or uncivilized. Our core temperature dropped. Our heart rates slowed. The ice that remained in the cooler had taken on an reddish tinge, but our hands had returned to their normal color. We looked up. The woman with the neat perm held an iPad in our direction. We were being filmed. “So, what do you ladies do when you’re not running?” She asked. “Um, I teach literature.” I responded. “I’m a psychologist.” said my friend. Mrs. Tulsa smiled. Her vacation movie promised to be a good one, full of local wildlife in funny outfits. I’m not sure she believed us. But we felt refreshed. It seemed like fair bargain. Our entertainment value made up for the damage we had inflicted on the contents of the cooler. We thanked them, and with the help of all the melting ice in our packs, made it back to our car. I still wonder about the video from this encounter. Has it inspired curiosity? Intrigue? Interesting conversations? Has it contributed to the growth of our sport? As far as I know, it has not gone viral on YouTube, but then again, I haven’t checked. Thank you, dear couple from Tulsa. We will never forget you, or your cooler. Yes, the heat training did pay off. This entry was posted in Uncategorized on August 31, 2014 by silvakat. KAT, that was a great story! Good luck to you ladies in your future endeavors. Gotta run for the health of it. Good luck at Imogene.